Now that I've (mostly) run out of one-page dungeons to share, how about something from the other end of the spectrum? You know: something in the megadungeon range. Underlord of Cold Mountain is, in my mind, in that range. I like to think of it as a mini-megadungeon, as self-contradictory as that term may seem. I created UoCM some time in the mid-90's, but I'm fairly certain the map predates that by a few years - at least. It may be even older than that; I seem to recall drawing the first section of the map shortly after purchasing the Moria supplement for ICE's Middle-earth Role Playing game - which would put it somewhere around 1985, I think. So, if I have the history of this dungeon correct: the map was first drawn in the mid-80's; more sections were appended in the late-80's; and the key was created in the mid-90's. UoCM served as the lair of the Big Bad of my campaign setting of that time period. As such, there are references in the dungeon's key to people and places specific to that setting. 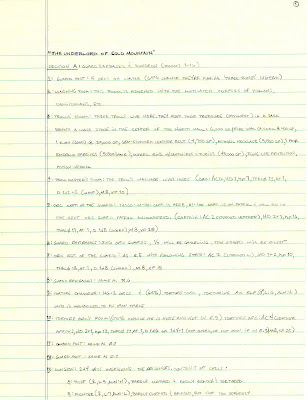 Later this week, I'll post some of my notes so that these references will have a little more meaning to you. 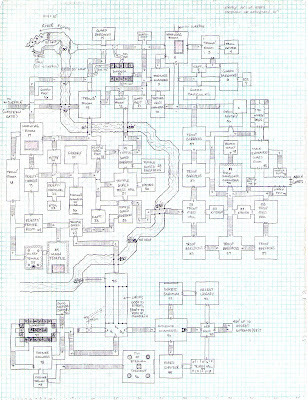 The dungeon itself consists of a one-page map representing 50+ rooms (although there is only one dungeon "level"), a diagram of "Cold Mountain," a 13-page room key (covering the four discrete sections of the dungeon), and several pages of various monster and special location descriptions. I'll be posting the components of the dungeon today, tomorrow, and Wednesday. On Thursday and Friday, I'll post some of the background notes I have regarding the campaign setting in which UoCM resides. Yup. Good to go! Excellent maps btw, I've saved 'em all over the last week or so (and the older ones too).